More Police Training Key To Determining Who Is A 'Good Guy' With A Gun Two black men killed by police recently in Alabama and Illinois were mistaken as suspects. Both were armed. Police trainers say there are steps departments can take to help prevent deaths. 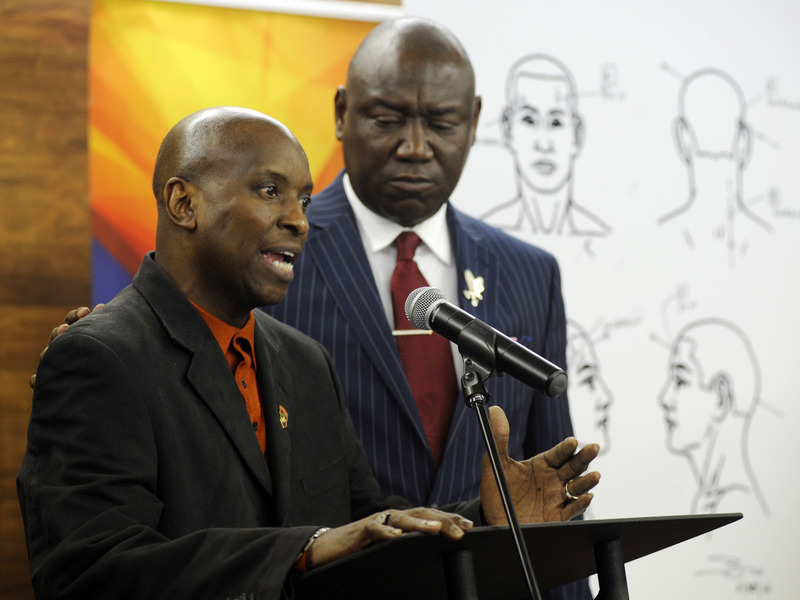 Flanked by attorney Ben Crump, Emantic Bradford Sr. discusses the results of a forensic examination on his son Emantic "EJ" Bradford Jr., who was fatally shot by police after a shooting in a shopping mall on Thanksgiving Day, after being mistaken for a suspect. The recent shooting deaths of two black men by police have reignited protests about police use of force. In both cases, the men had guns and police wrongly mistook them for suspects. On Thanksgiving night, a white police officer fatally shot 21-year-old Emantic Bradford Jr. at a mall in Hoover, Ala., a Birmingham suburb. Bradford and others were running from a shooting that left two people injured. Some witnesses said during the pandemonium that followed, some of those running away pulled out their guns for their own protection. Police later said Bradford was not an assailant. He and other police say determining who's the good guy in those types of situations can be difficult. They say what's needed is better police training and public conversation about how police work. Loughlin says people don't have realistic information about policing — especially when it comes to situations like the ones in Illinois and Alabama. "Every officer that is involved that I've been on the scene with and talked to in my work says 'it wasn't really wasn't a decision for me, it was just a reaction; I just had no choice I reacted to what was in front of me at the time'," recounts Loughlin. He adds the officers often say, "I don't know if this guy is a good guy or a bad guy." Police say their job is increasingly risky because there are so many guns and conceal carry laws in the country. While there's no official count, the nonprofit Small Arms Survey estimates Americans possess nearly 400 million legal and illicit firearms. Former police officer David Klinger heads the Criminology Department at the University of Missouri-St. Louis. He's written a book about police shootings and is a research fellow at the National Police Foundation. Because police often have to make split-second decisions in situations where guns are involved, he says, good training is essential. "And one of the points of training should be that merely because an individual has a firearm or some other weapon does not mean that they are an individual who needs to be shot," says Klinger. The National Law Enforcement Officers Memorial Fund tracks police fatalities. It reports about 50 officers a year lose their lives from gunshot wounds. Some are "blue on blue" incidents where law enforcement officers mistakenly kill one of their own — like the case of Jemel Roberson. Although there is some dispute over whether Roberson could be clearly identified as a security guard. Pete Blair is the head of an active-shooter response training center at Texas State University. He says in situations where there's active gunfire or the threat of it, police are under a lot of stress. "Whenever anybody is under high stress," says Blair, "that tunnel vision starts to kick in and their field of view is really narrowed. And they may miss key identifiers that somebody is security or another police officer in there." Blair says training can help overcome some of those stressors by teaching officers what he calls an effective scanning sequence. He says that includes emphasizing "how to look at the person that they are potentially going to engage. To look at key areas for identification — that kind of thing." "Active-shooter" training has increased around the country in recent years but, with about 18,000 police departments, methods are more patchwork than consistent. Activists say what really colors the decision police make in shooting incidents is racial bias. Benjamin Crump is the lawyer for the family of the man killed in Alabama. He says race was at play when Emantic Bradford Jr. was shot by police. "He saw a black man with a gun and made a determination that he must be a criminal," says Crump. Former Assistant Police Chief Joe Loughlin disagrees and says that's not how most police work. "We look at things by behavior. Are there jerks out there? Are there bad cops? Sure. Are there racists out there? Of course," he says. "But by and large the majority are considering what's presented in front of them." Zimring says what's needed is more research examining the thousands of chaotic cases like the Alabama and Illinois shootings to help police devise better procedures. "Until we do that, the situation is going to be unmanageable as a kind of chronic condition," says Zimring. "And it's horrendously threatening to civilians and terribly threatening to police." The police trainers say there's evidence that when police are trained how to approach situations and better interact with people, the level of violence between them and citizens can be reduced.